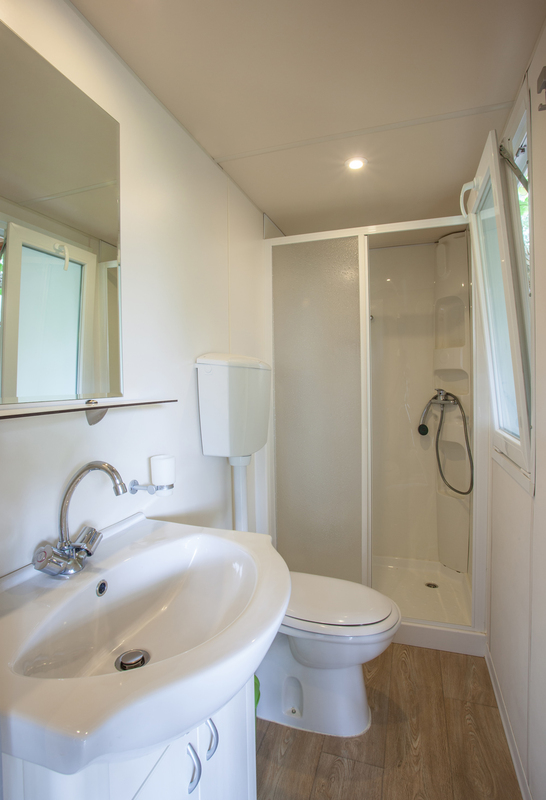 We have large shaded pitches equipped with individual sockets (220v) for tents, camper vans and caravans. 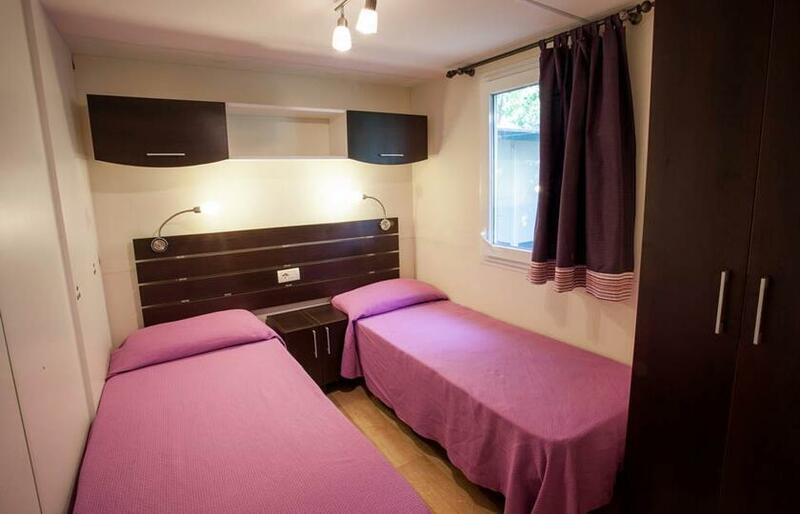 The price includes access to the swimming pool, the five-a-side football pitch and other services. 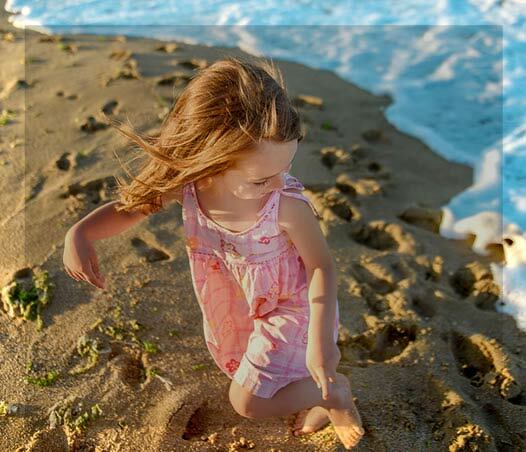 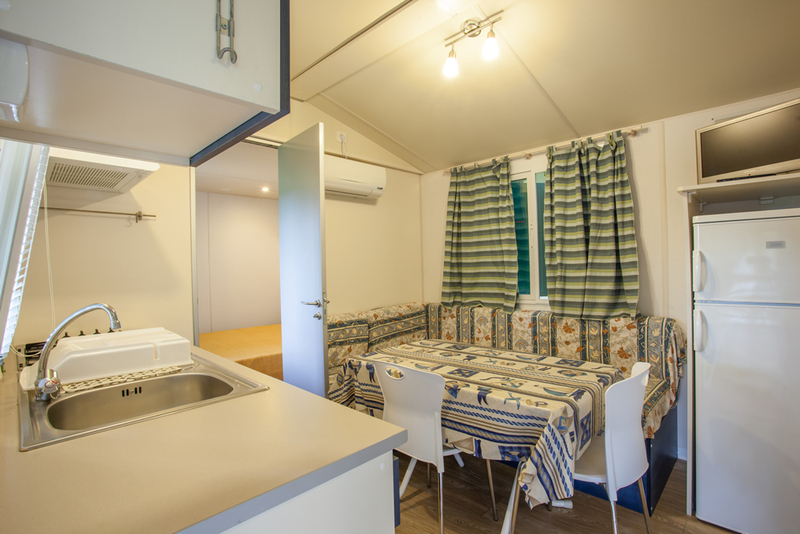 Our mobile homes have large indoor and outdoor spaces ideal for families wanting to enjoy a holiday characterized by comfort. 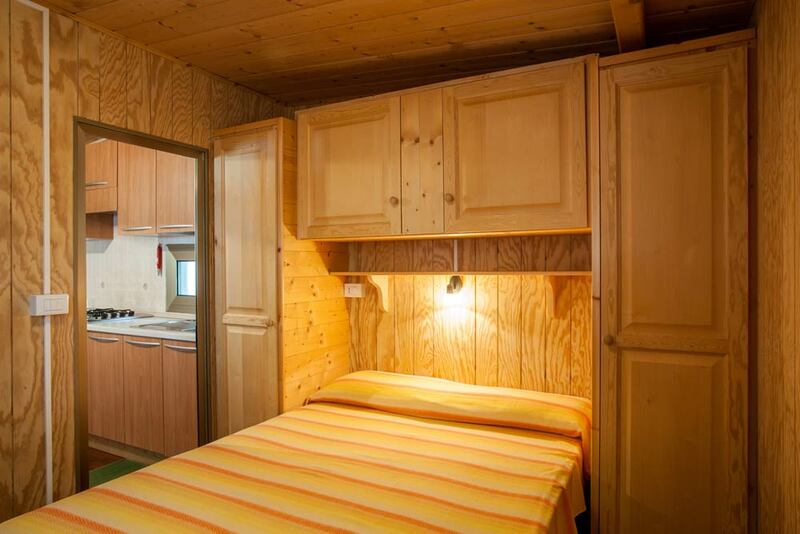 We have various types of chalets to best meet the demands of our customers. 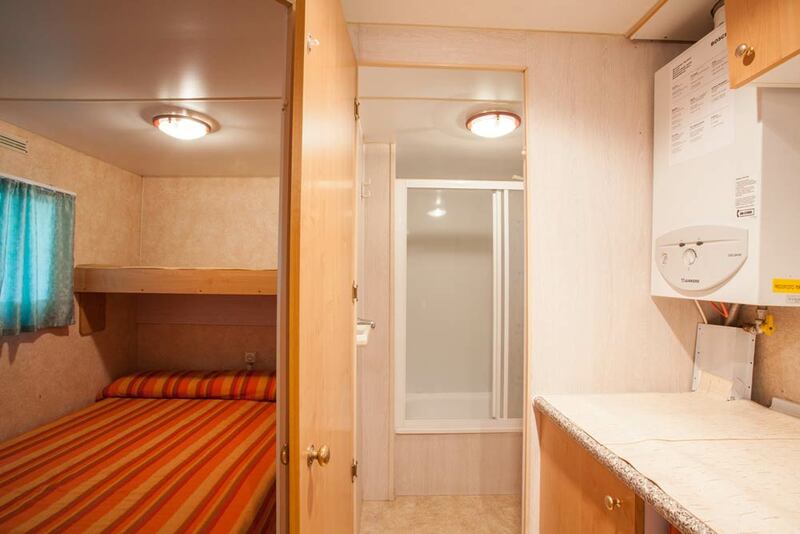 Our 3 or 4-seater caravans have a double bed and single beds, an aluminum veranda with kitchenette (gas cooker, sink, fridge, furniture) and bathroom with water closet. 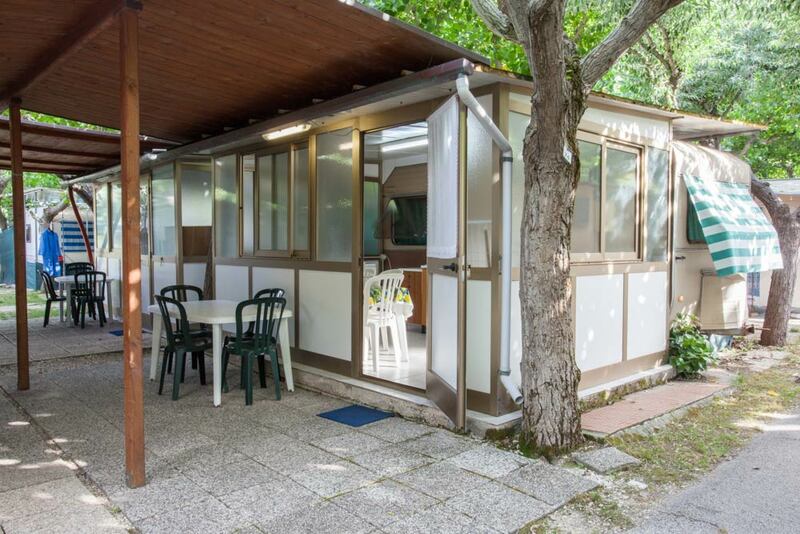 These classic solutions offer the right balance between indoor and outdoor spaces, and are excellent value for money. 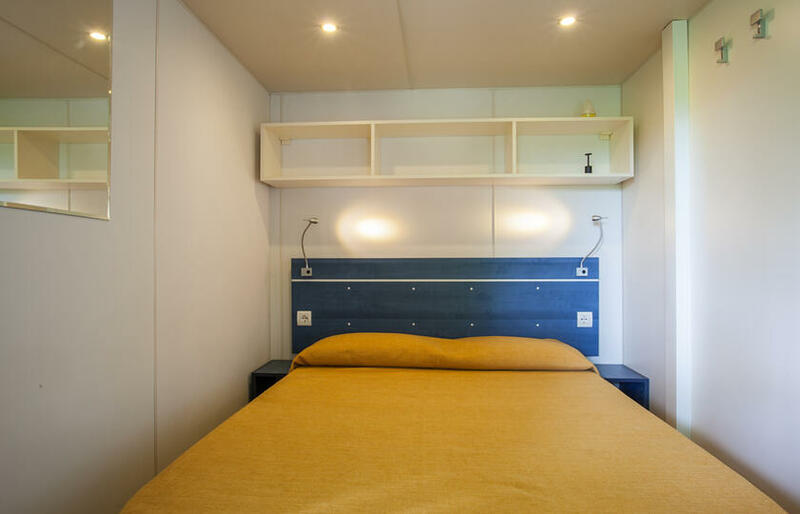 Comfortable and dynamic, the mobile home Rodi has a unique style that makes it more intimate and cozier. With its 6.40 x 3 meters, this smaller home can accommodate a family of 4 people. It has a double bedroom, a room with two single beds, living room, LCD TV, kitchenette with sink, fridge and kitchen equipment, bathroom with WC, washbasin and hot shower, outdoor veranda. 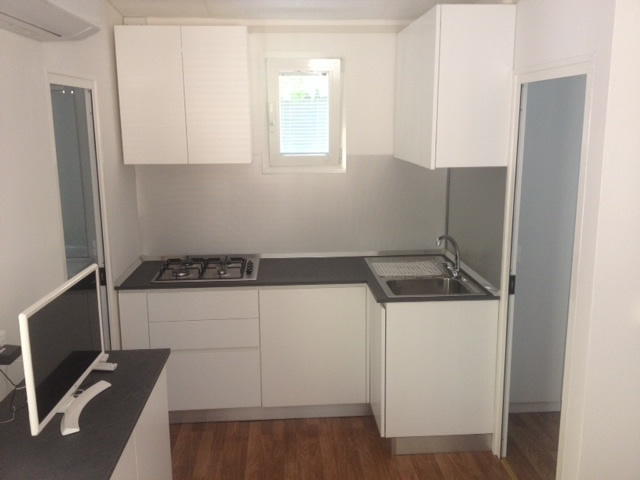 This 4-bed model has been designed to offer every kind of comfort even to disabled people and can provide a better living quality. 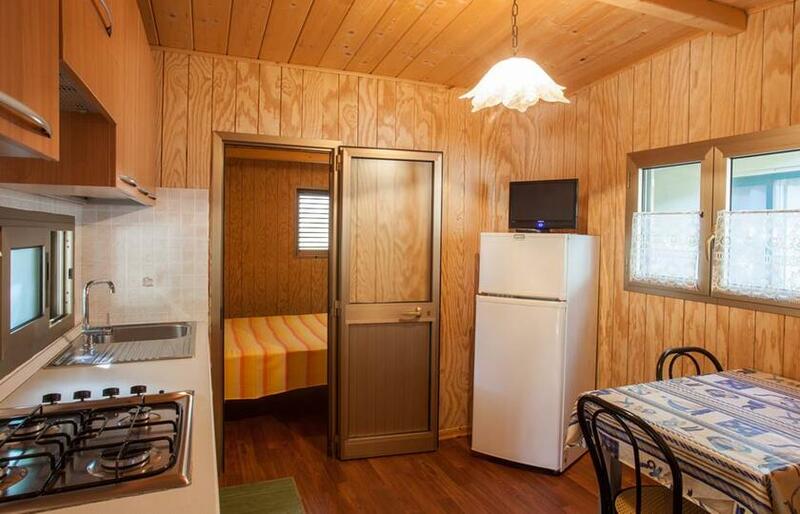 It is also aesthetically pleasant, and has modern furnishings. 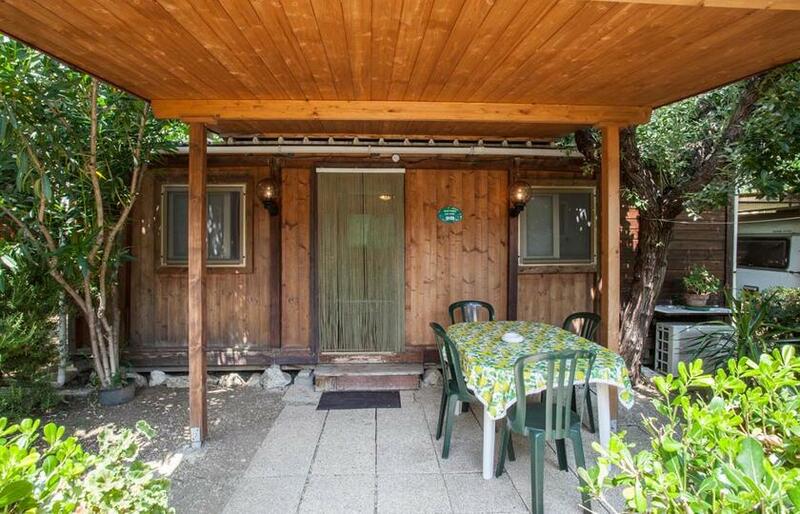 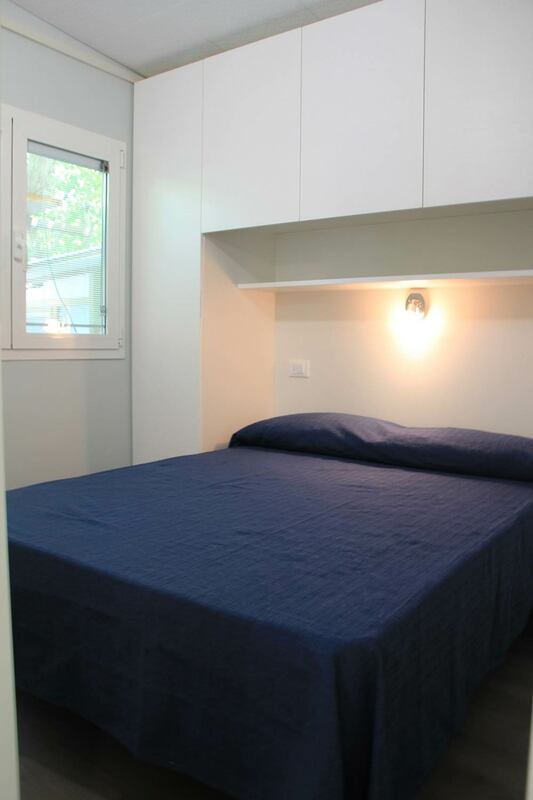 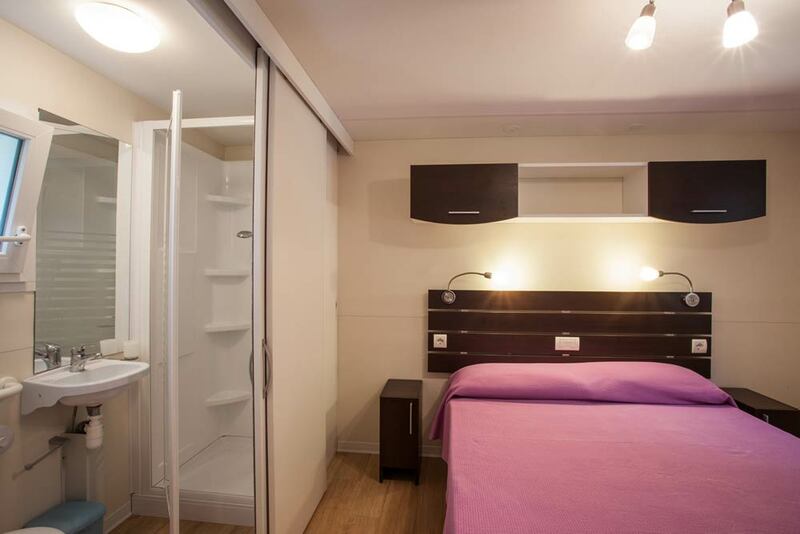 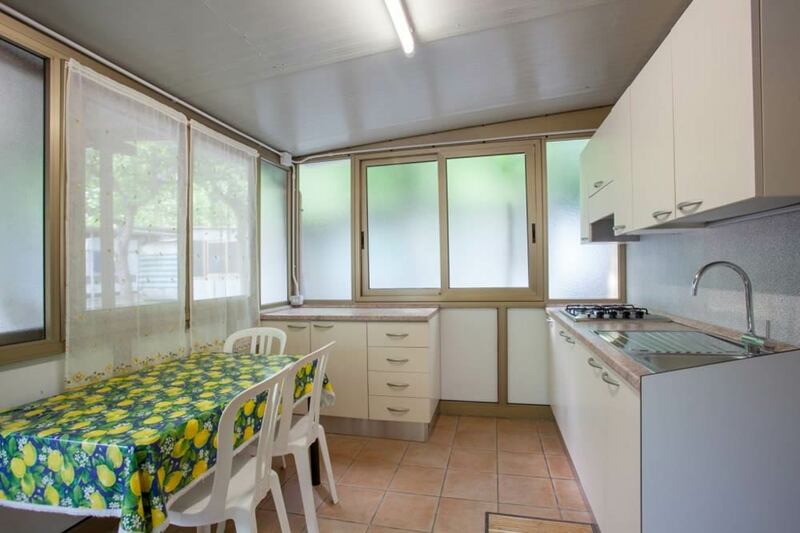 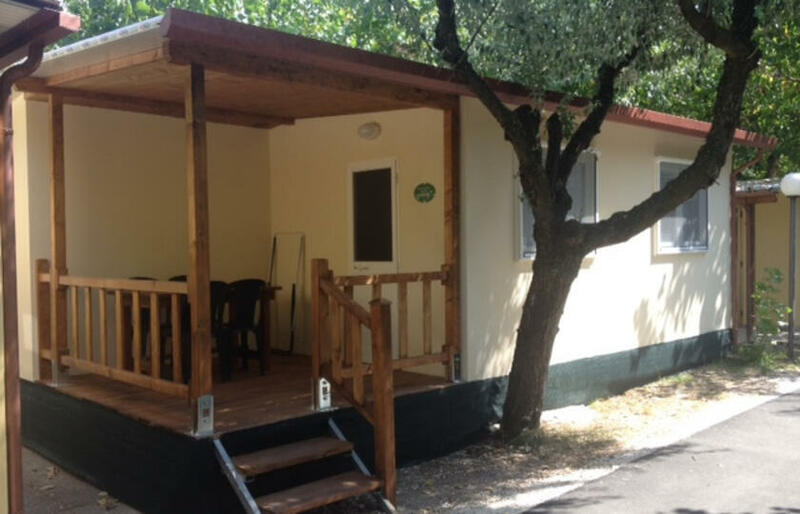 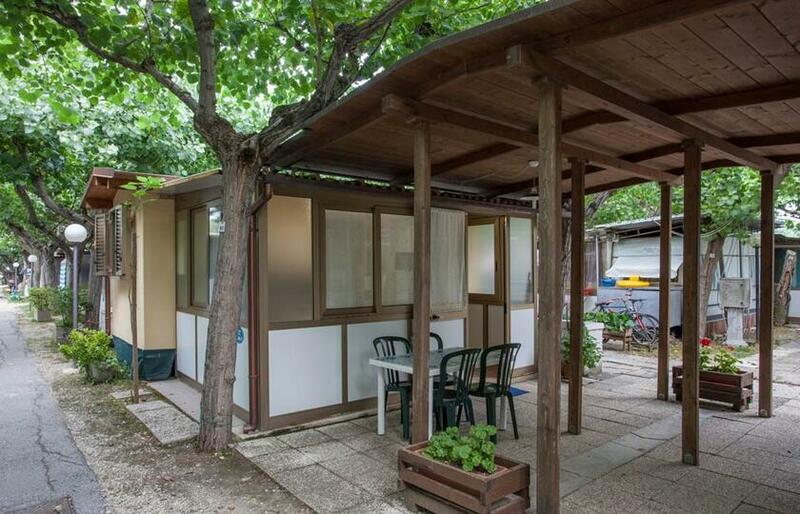 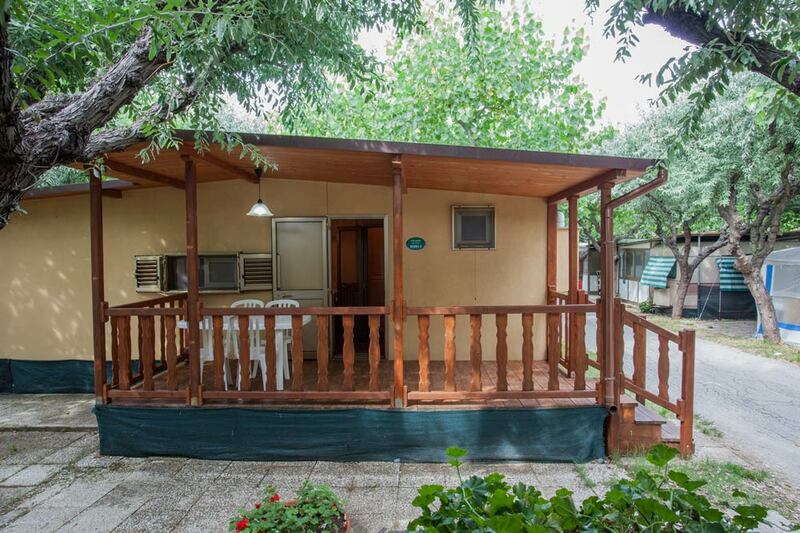 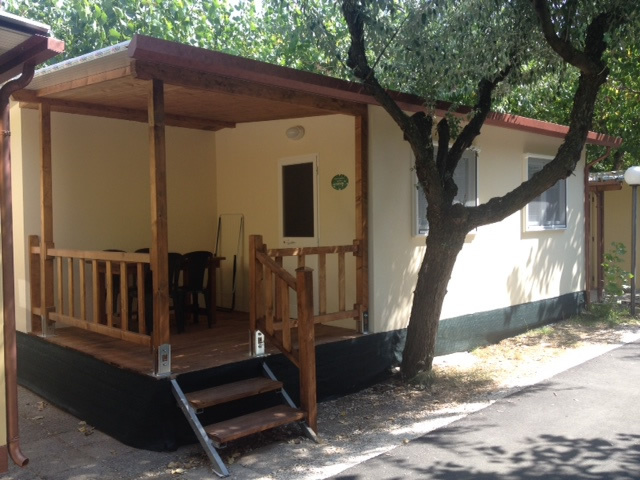 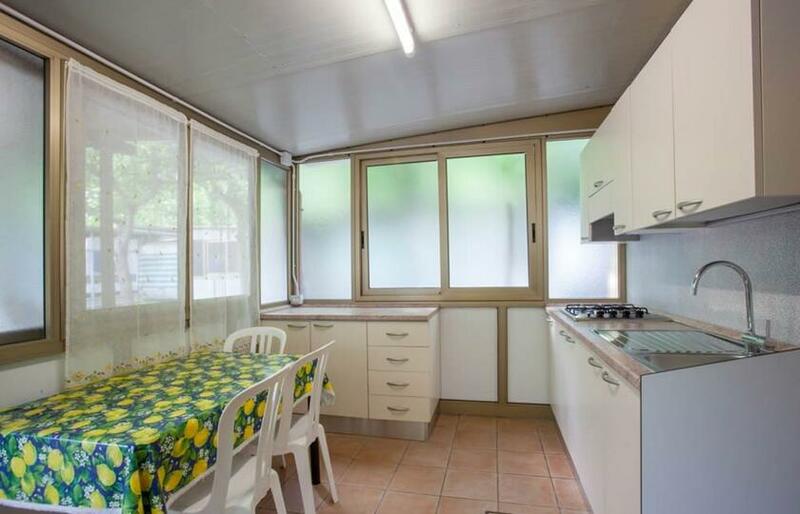 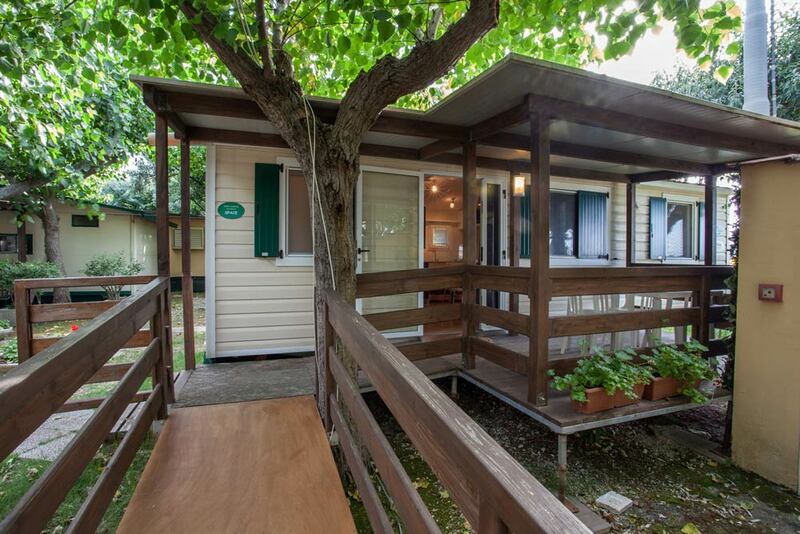 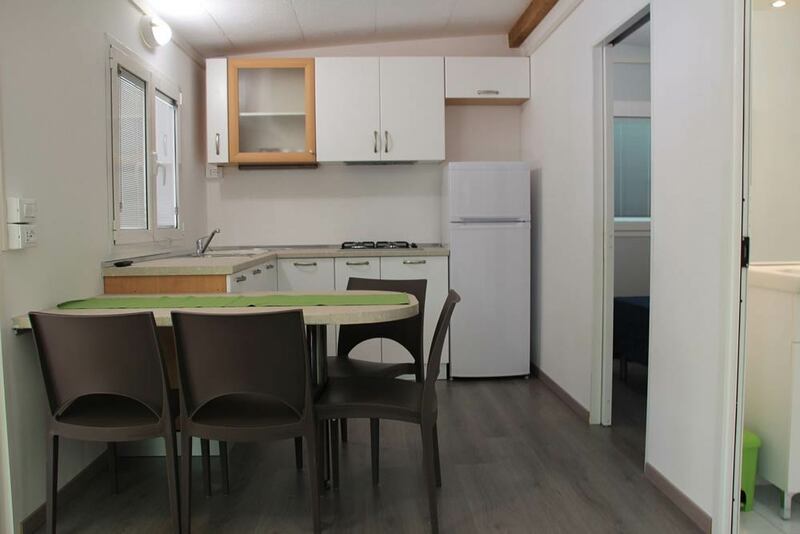 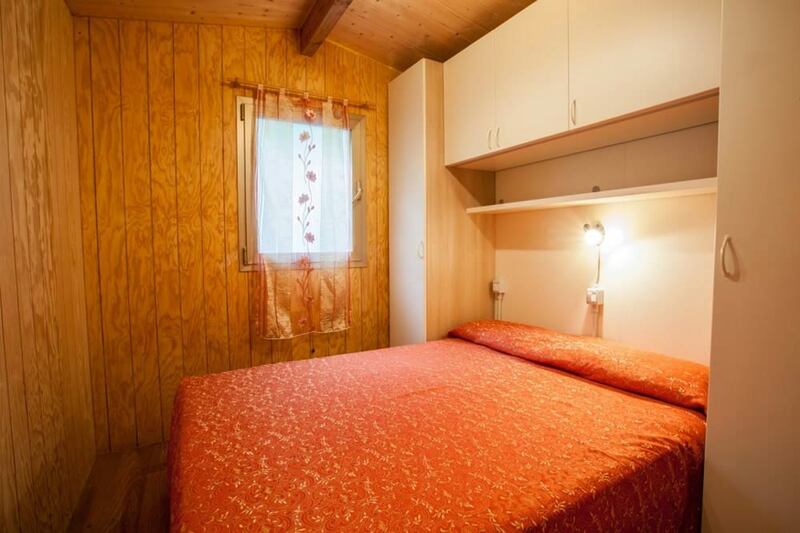 With its 8.30 x 4.00 meters, this larger home has comfortable spaces: a double bedroom with private bathroom, a room with two single beds, a large dinette with kitchen, LCD TV, and a main bathroom equipped for disabled people. 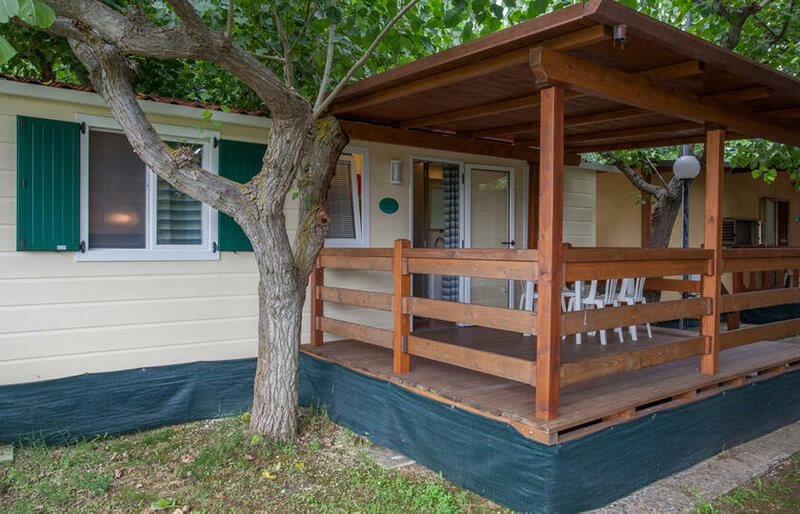 A convenient ramp facilitates access to the cottage and the outdoor veranda. 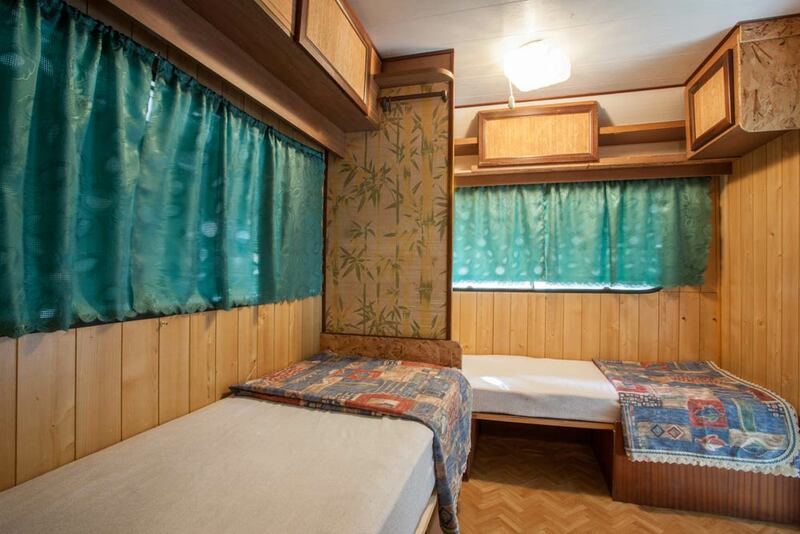 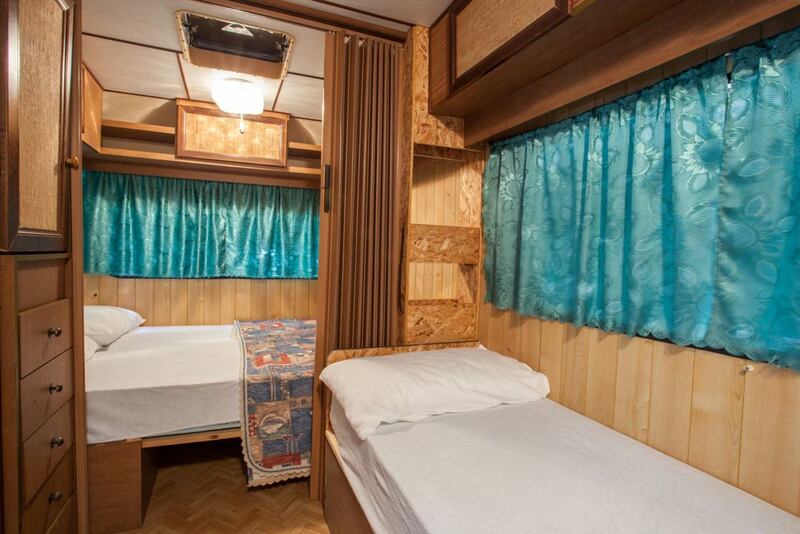 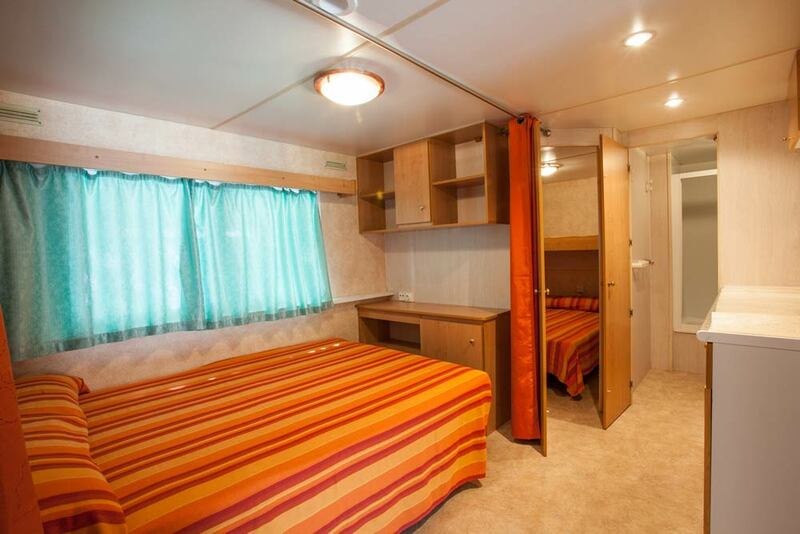 The most versatile of mobile homes, it has up to 7 beds. 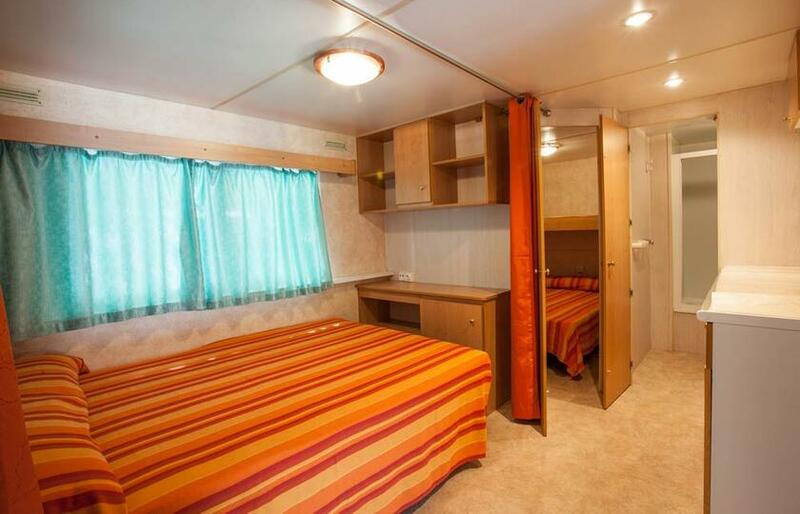 Ideal for large families or groups of friends, it has 2 separate bedrooms with double beds, a third double bed with curtain, a bathroom with WC and a separate shower area (hot water) and washbasin. 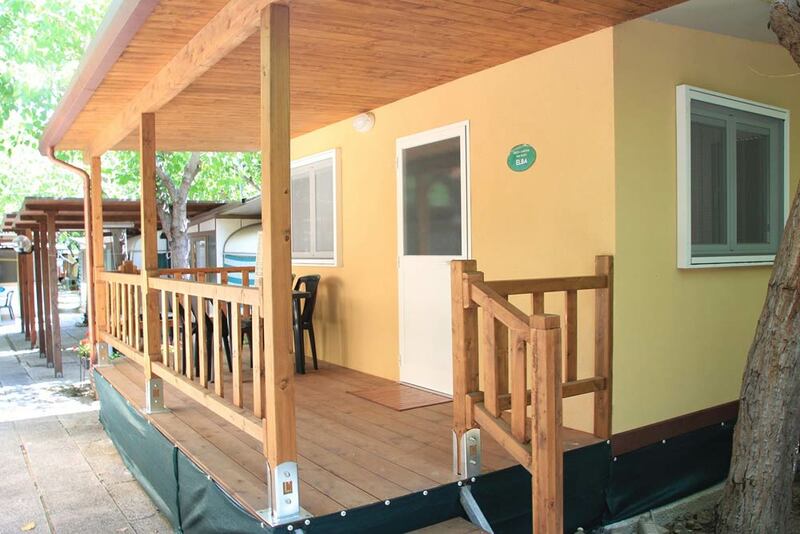 The large veranda is equipped with fitted kitchen and sofa bed. 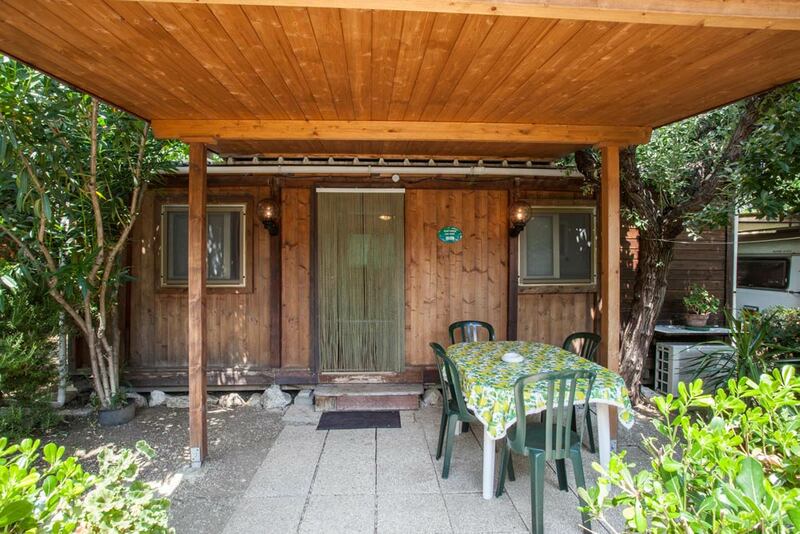 Outdoor space with wooden gazebo. 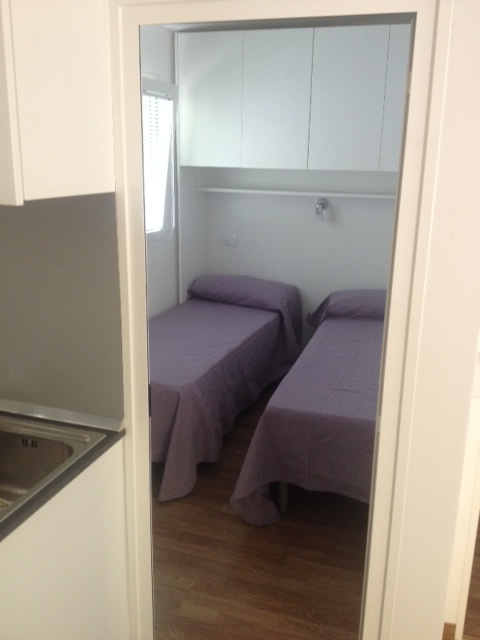 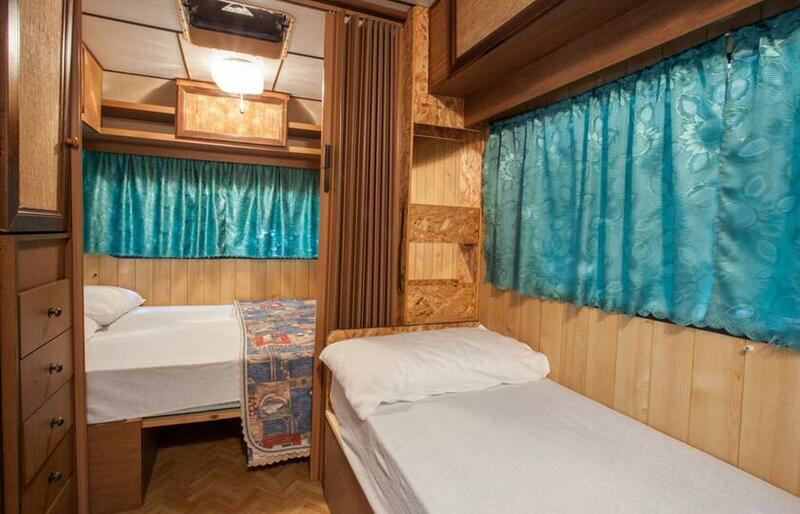 The mobile home Ibiza is equipped with LCD 19″ TV. 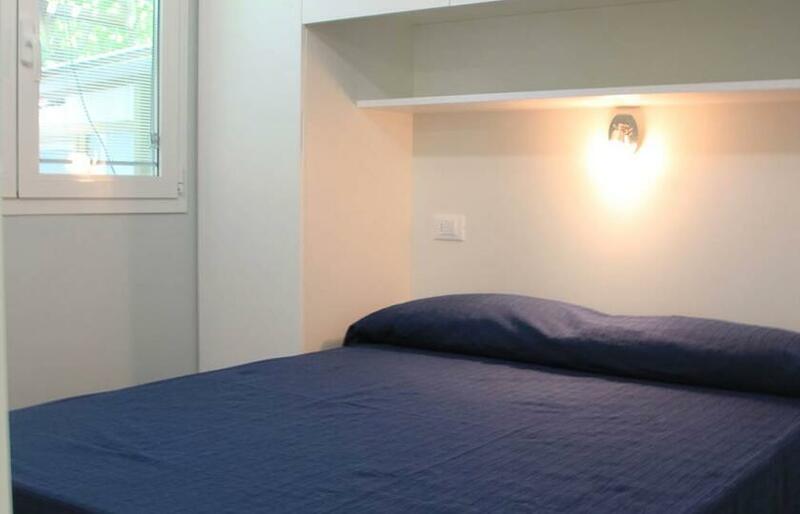 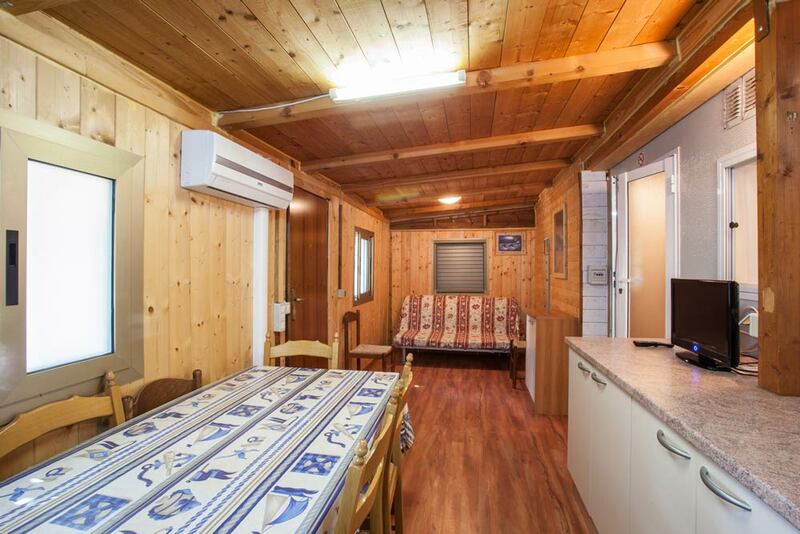 Comfortable living unit with sleeping area made of insulated wooden panels and aluminum veranda. 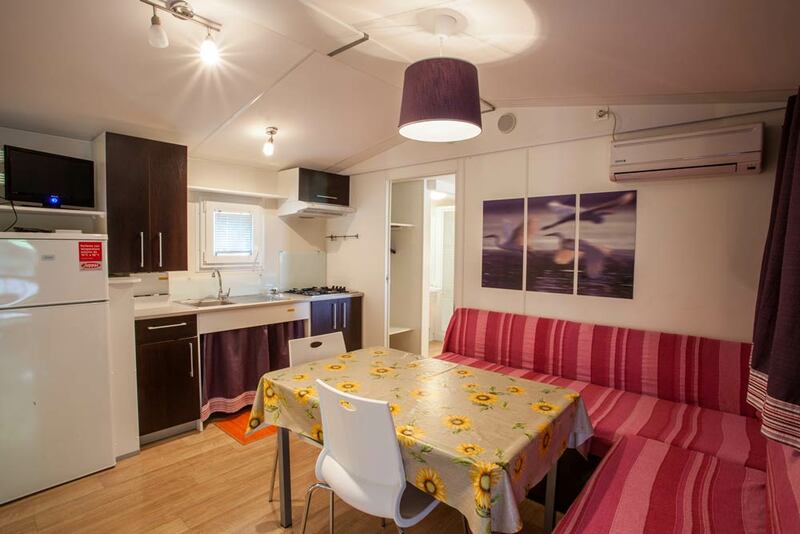 Suitable for up to 4 people, it has two separate bedrooms, a double bedroom and a room with two single beds. 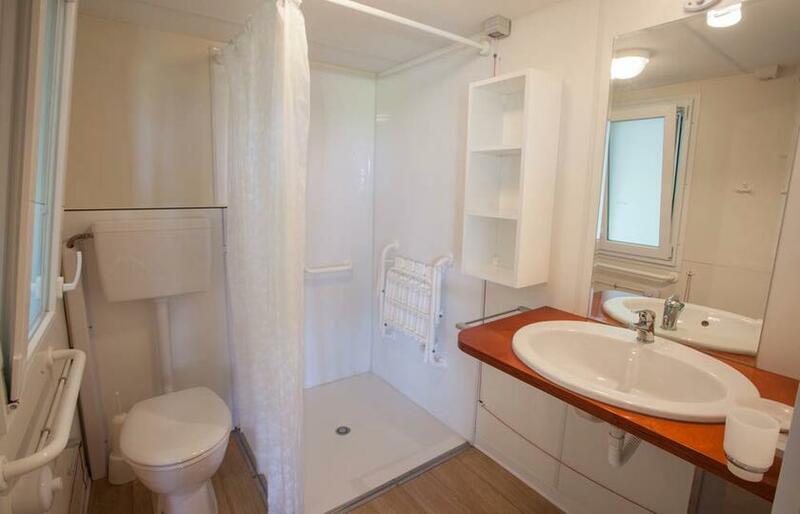 Bathroom with WC, washbasin, hot shower. The large aluminum veranda is equipped with a fitted kitchen. 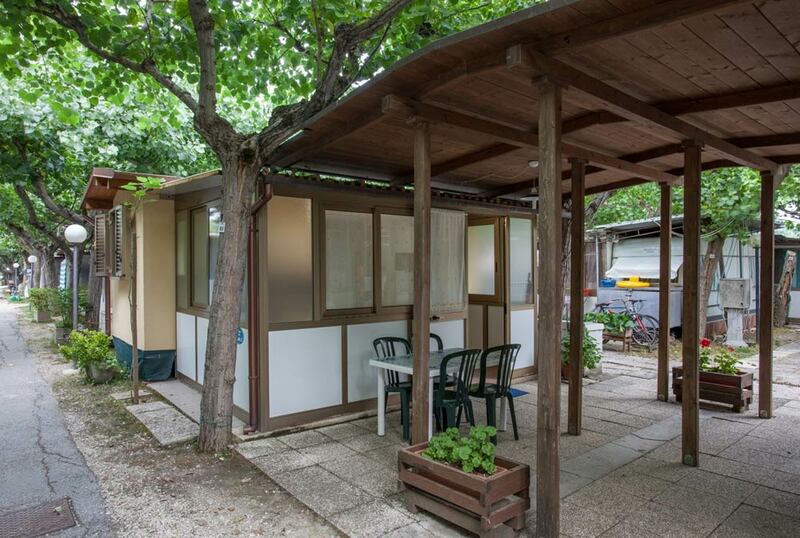 Outdoor space with wooden canopy. 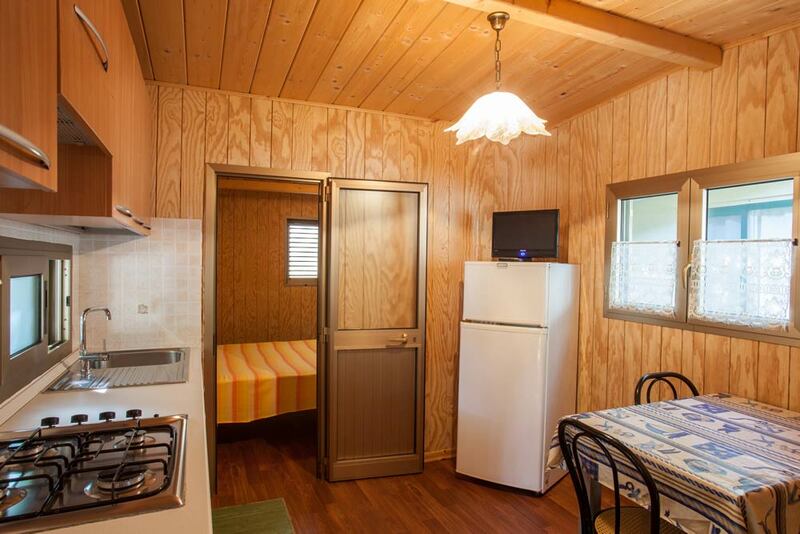 The mobile home Palma is equipped with LCD 19″ TV. 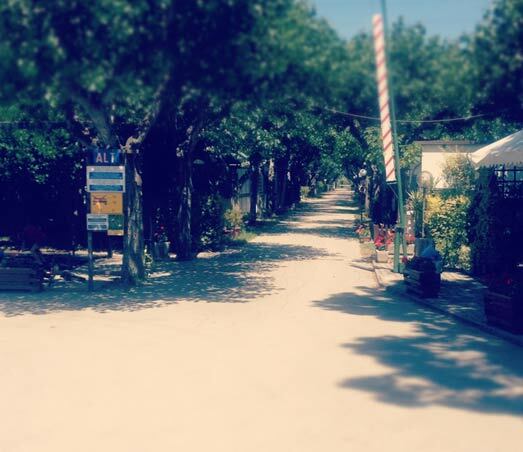 Size: 7 x 3 meters. 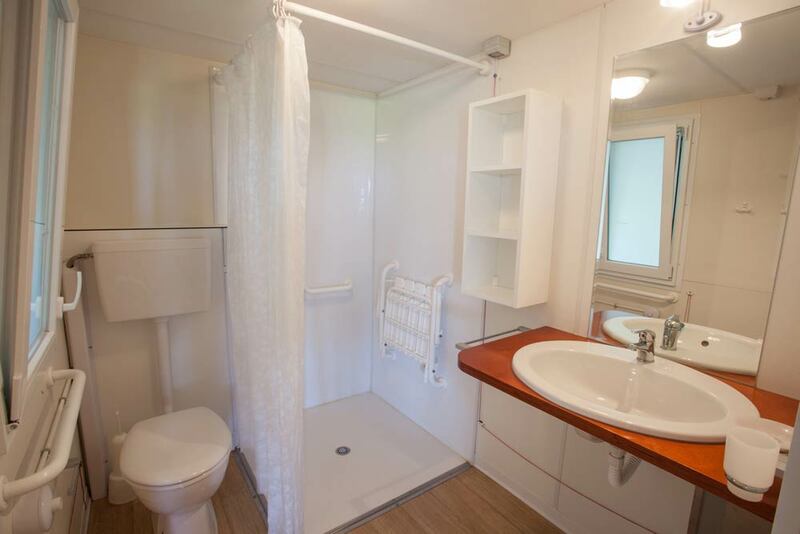 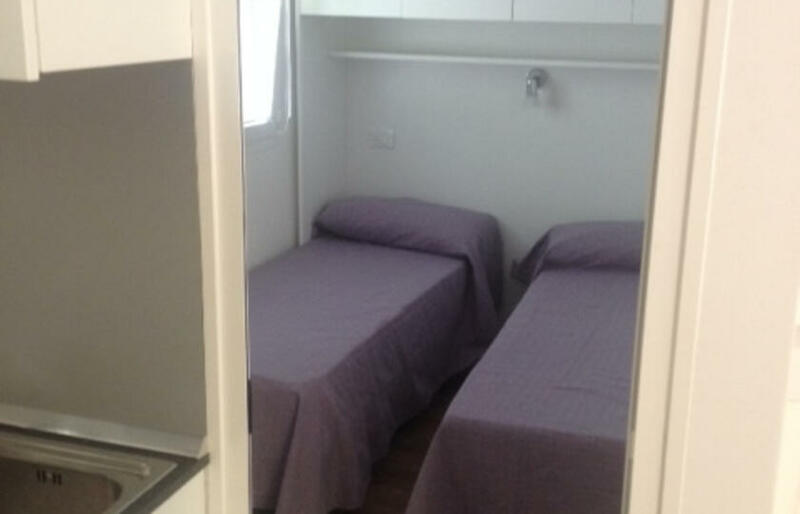 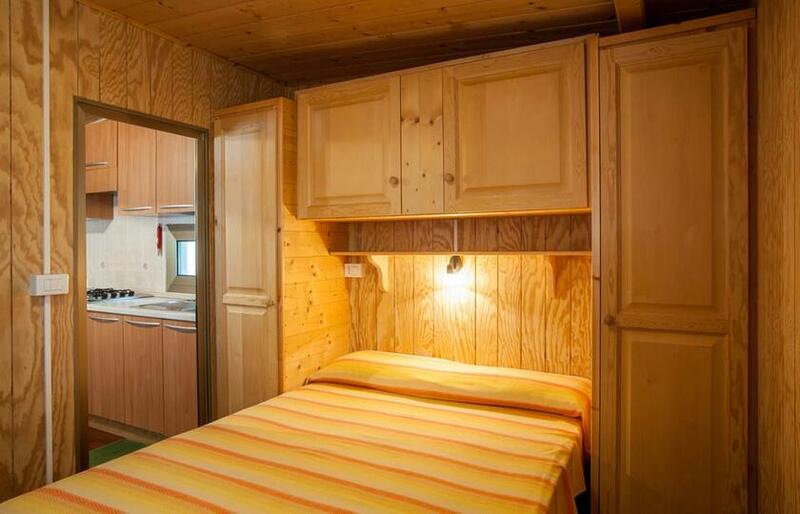 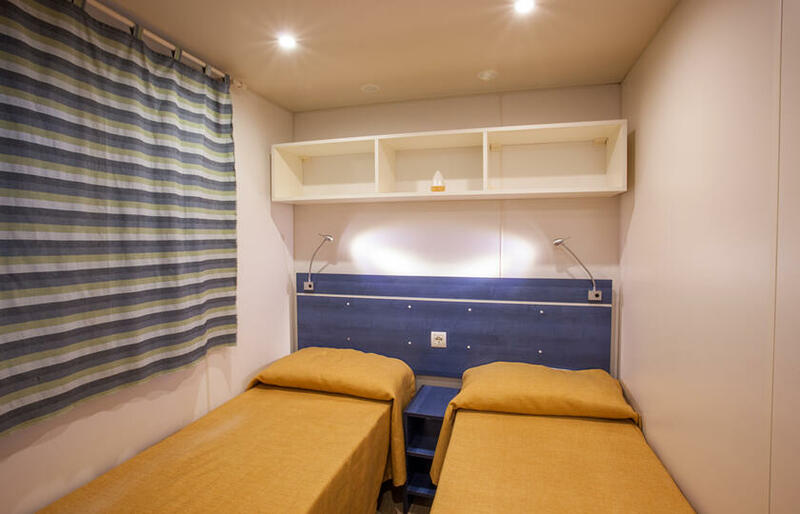 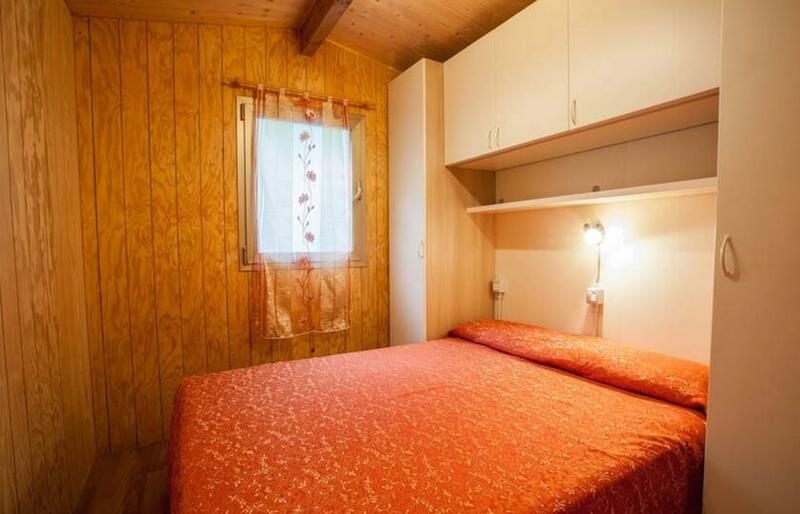 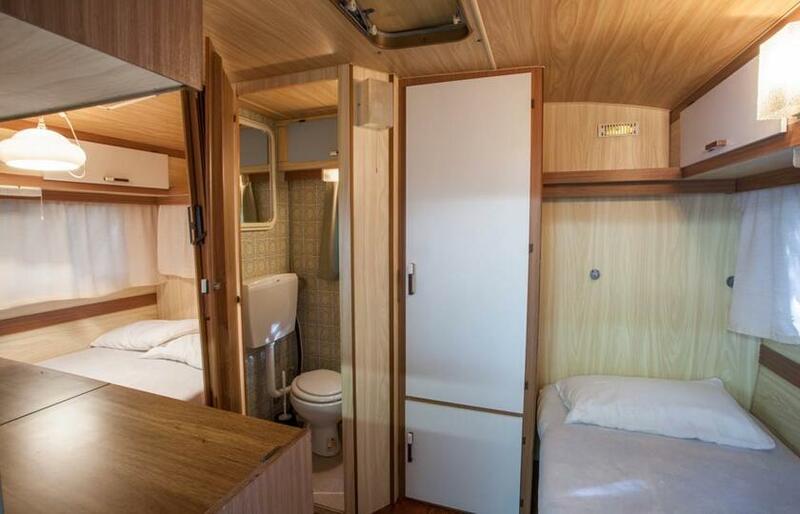 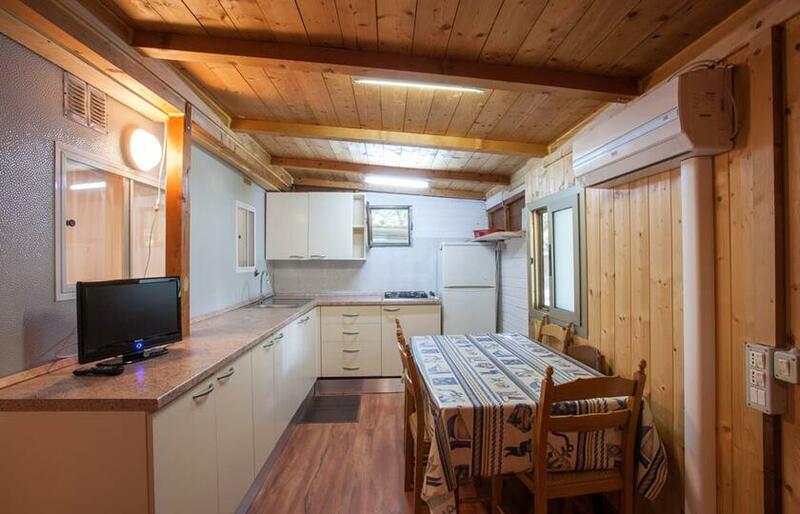 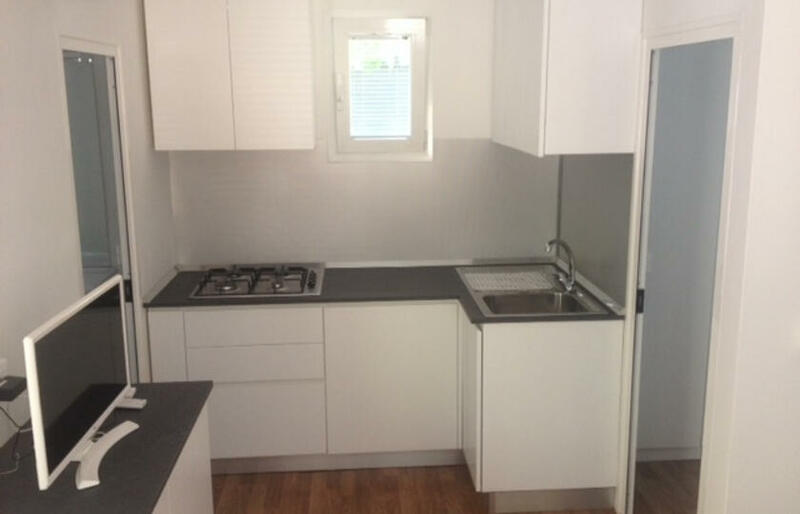 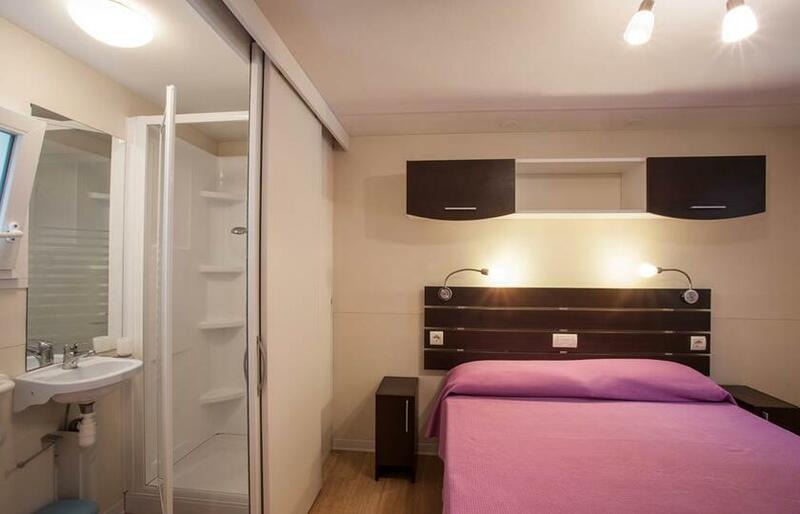 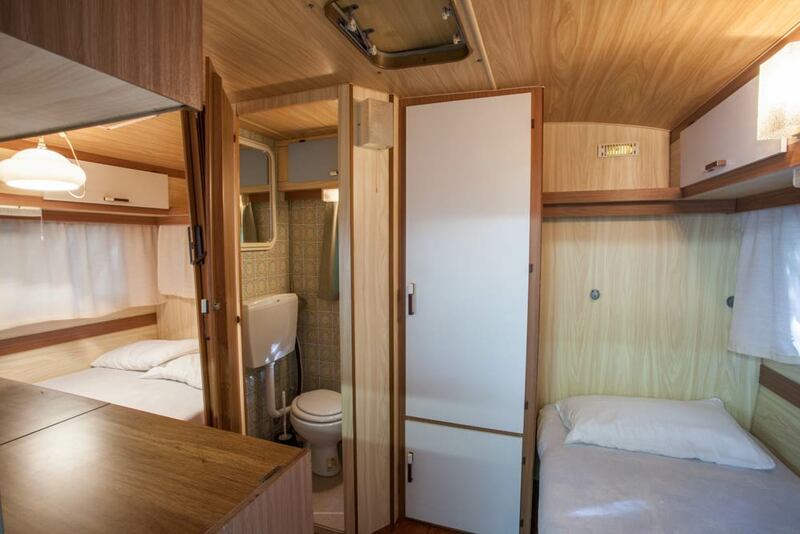 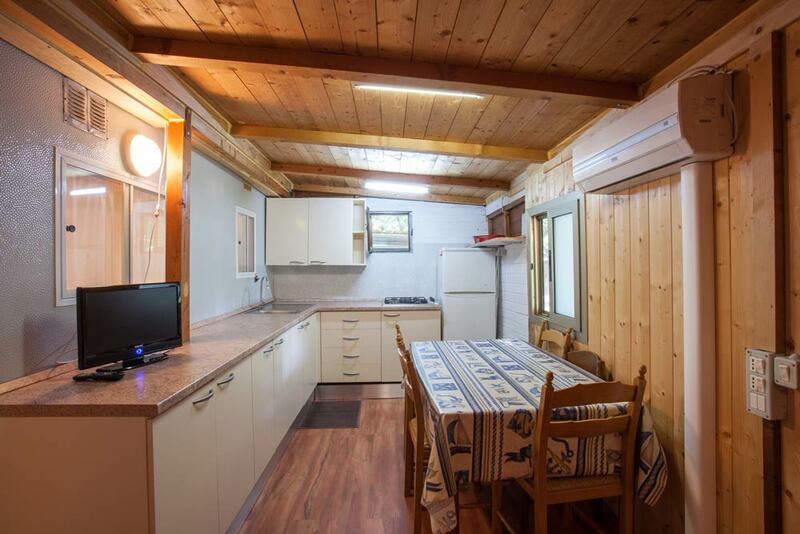 Consisting of two separate bedrooms, a double bedroom and a room with two single beds, a bathroom with WC, washbasin and hot shower, this new mobile home can accommodate up to 4 people. 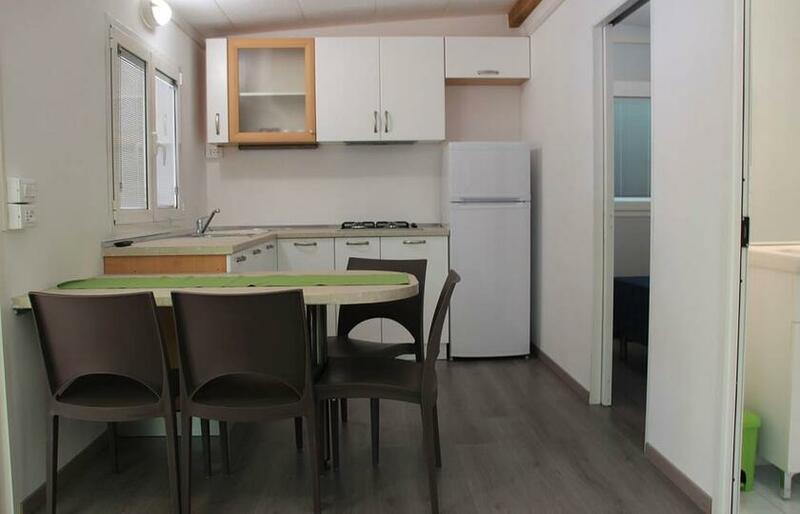 The living area is quite large and equipped with a modern fitted kitchen. 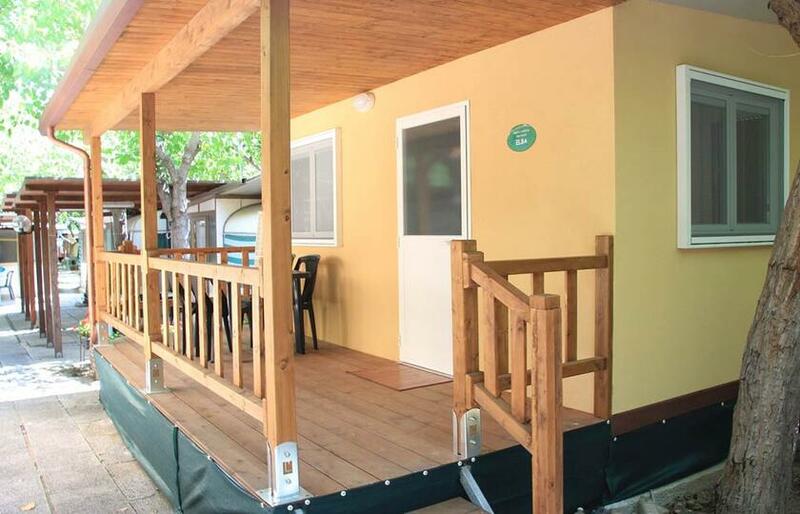 Outdoor space with wooden terrace. 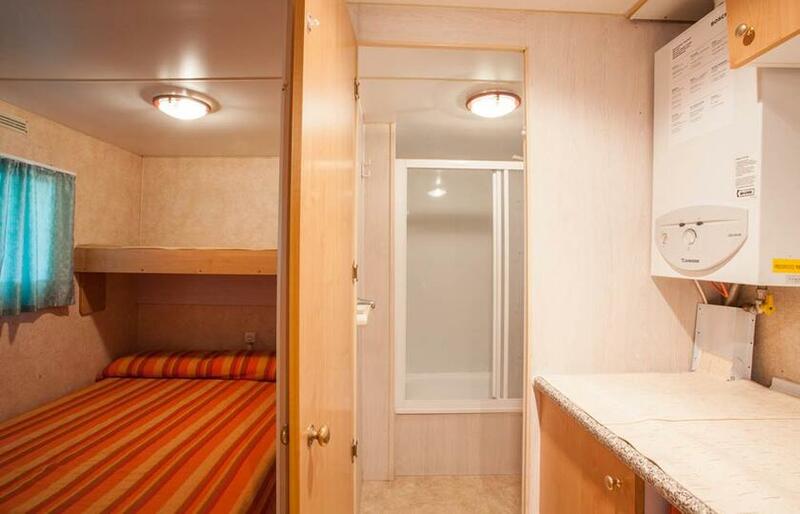 The mobile home Elba is equipped with LCD 19" TV. 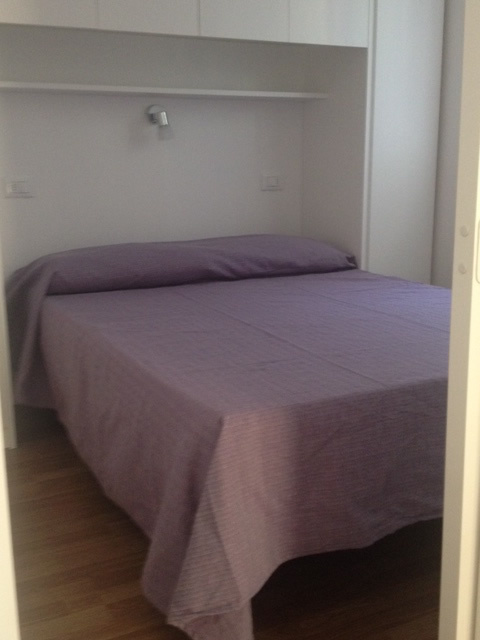 Size 6.50 X 4.90 meters. 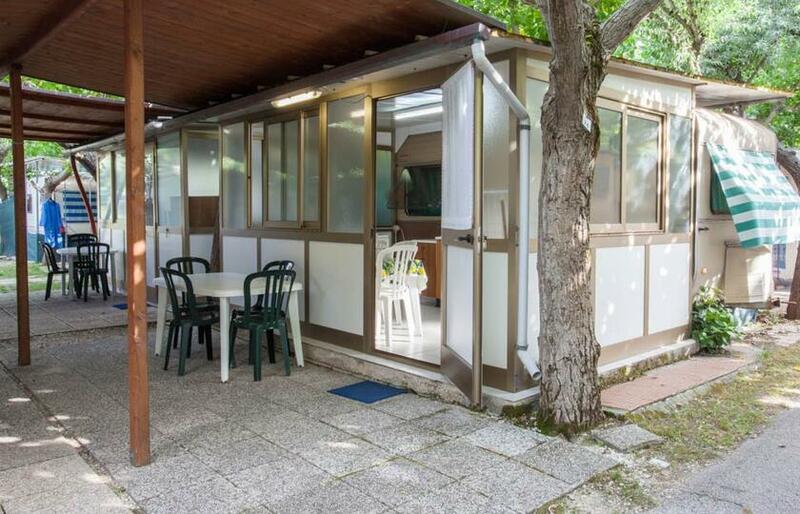 These classic solutions offer the right balance between indoor and outdoor spaces, and are excellent value for money. 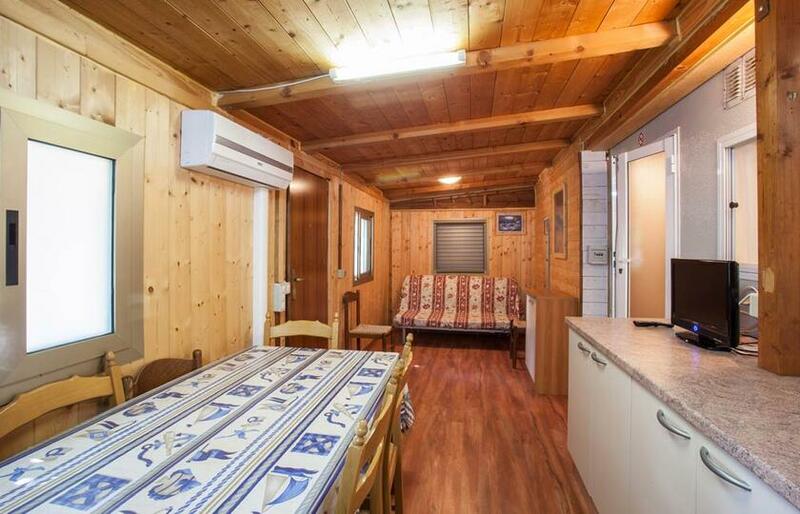 Reservation of mobile homes and caravans is by name and reserved to families. 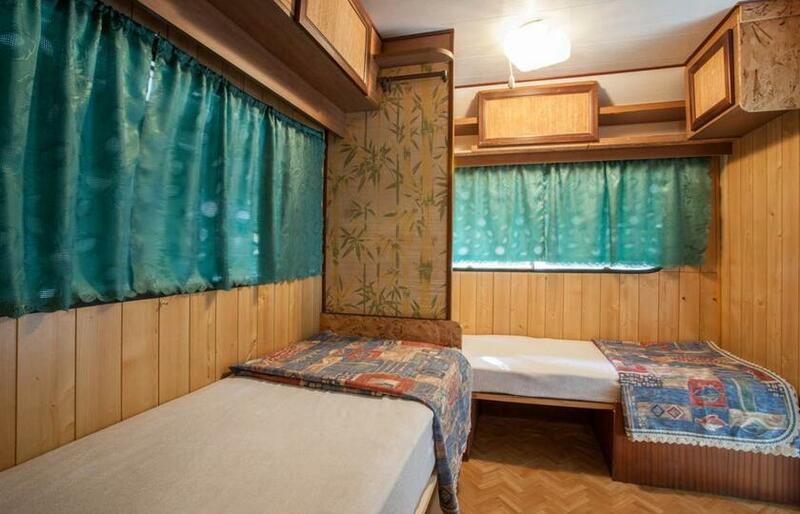 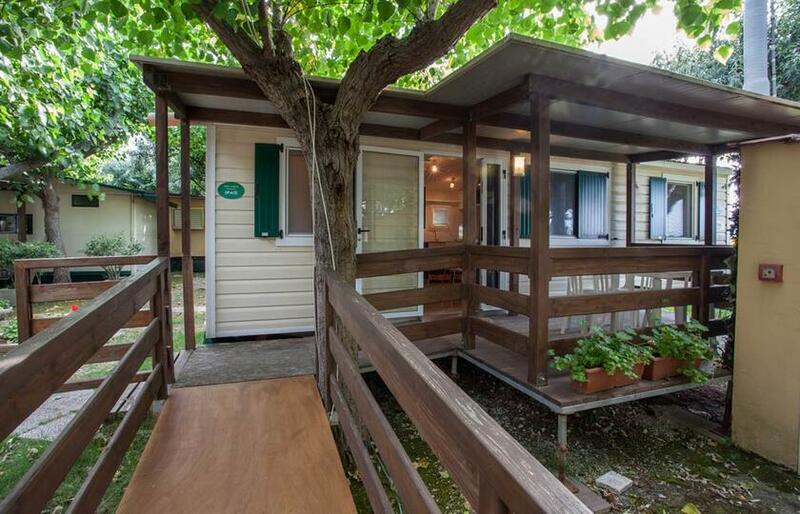 Both mobile homes and caravans do not have bath, kitchen or bed linen, but they are equipped with dishes. 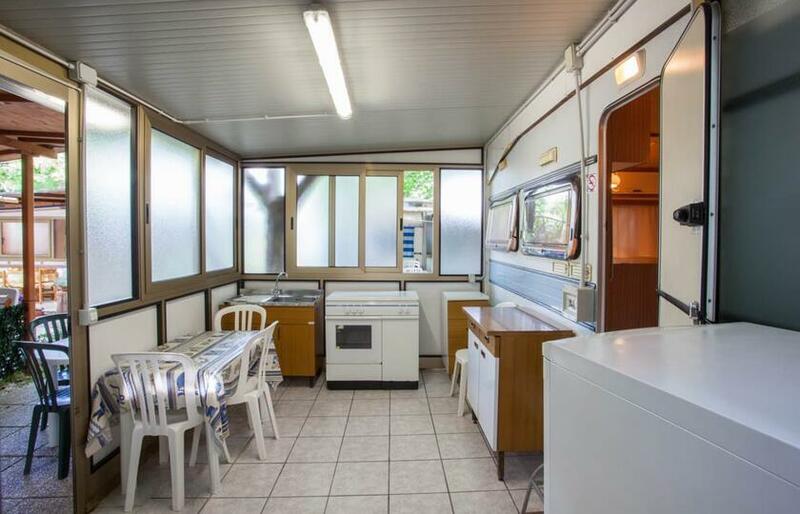 Mobile homes only have pots and pans. 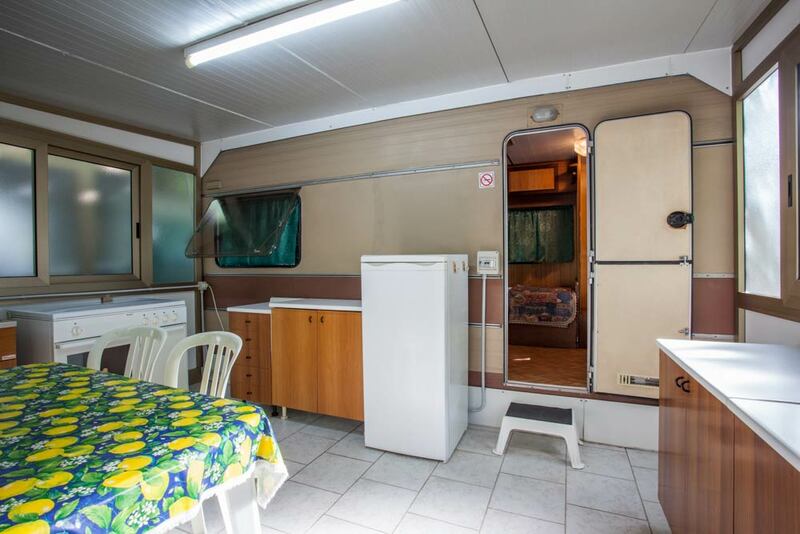 Mobile homes and caravans will be available to customers by 2:00 pm in the low and medium season, and by 5:00 pm in the high season, and they shall be vacated by 10:00 am on the day of departure. 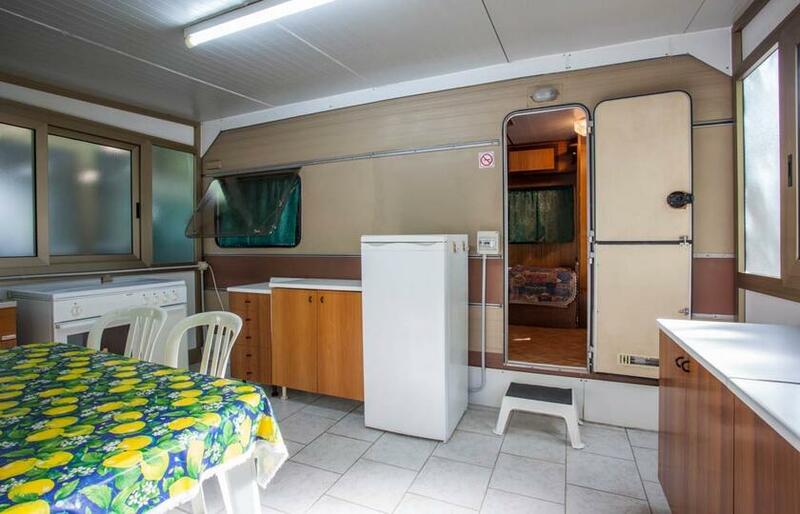 Upon arrival, a deposit of 100 euros is required for mobile homes and a deposit of 50 euros for caravans; any breakages or missing objects will result in the total loss of the deposit. 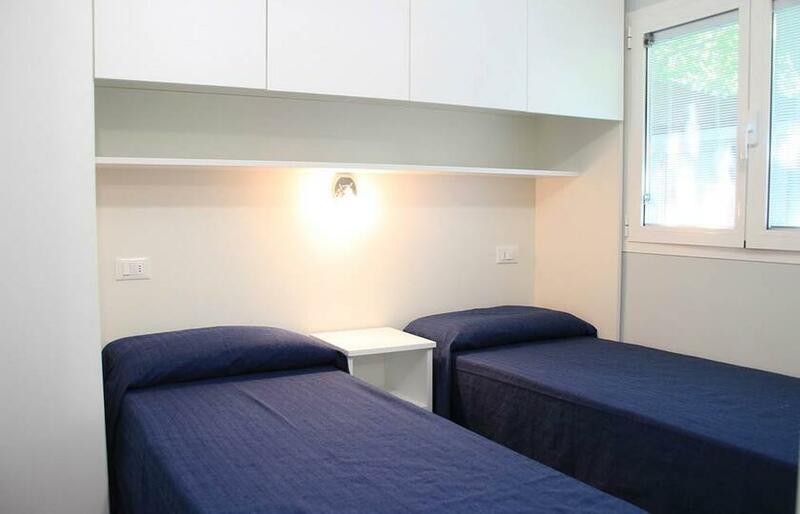 The housing units must be vacated duly clean and tidy. 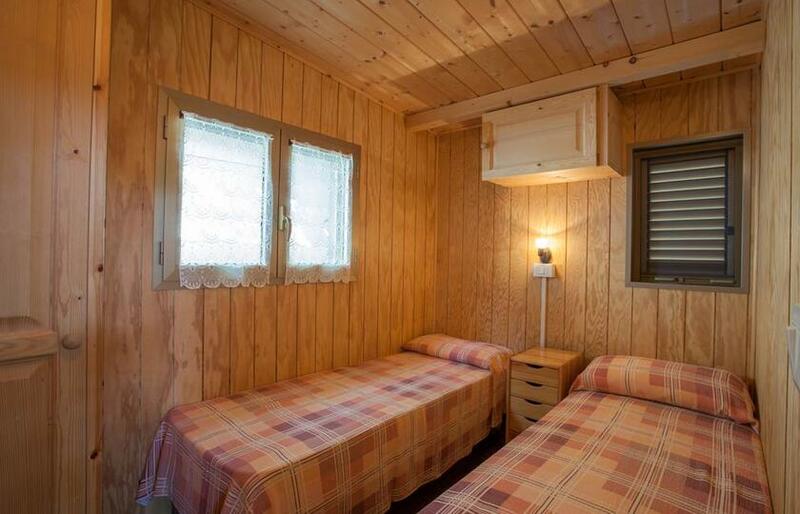 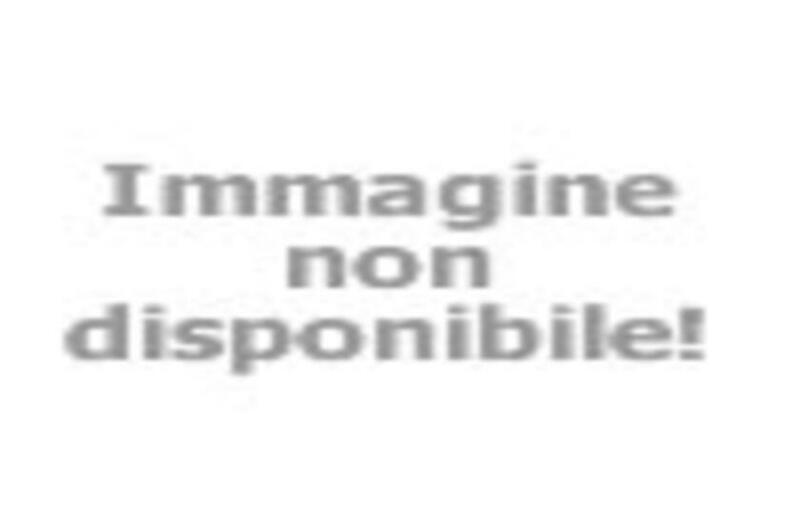 Otherwise, the cleaning costs (€ 30.00) will be charged. 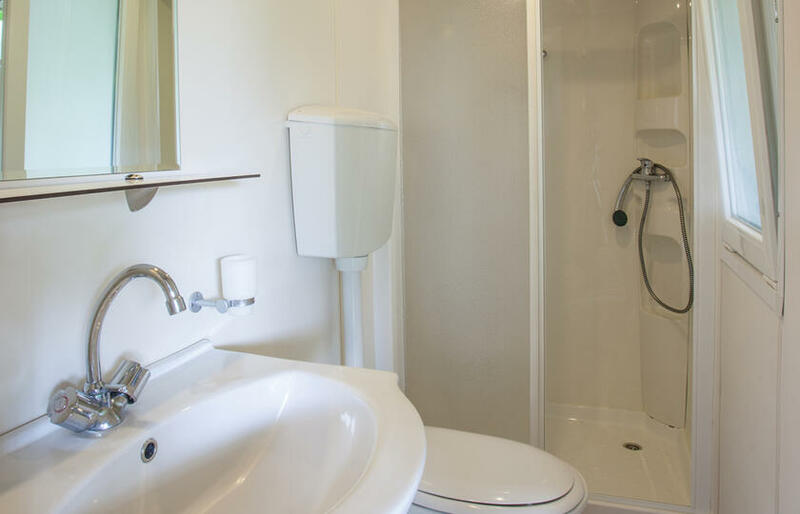 For small pets, € 50 is required for final cleaning costs. 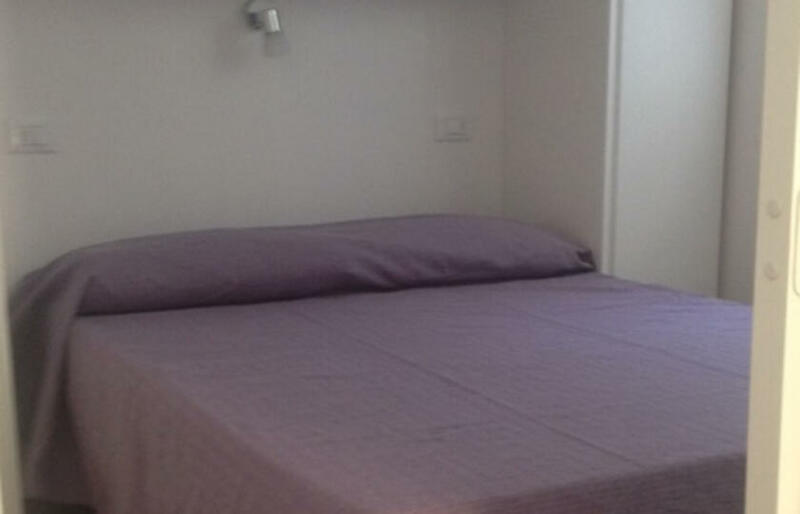 Booked periods not spent entirely due to late arrival or early departure must still be paid. 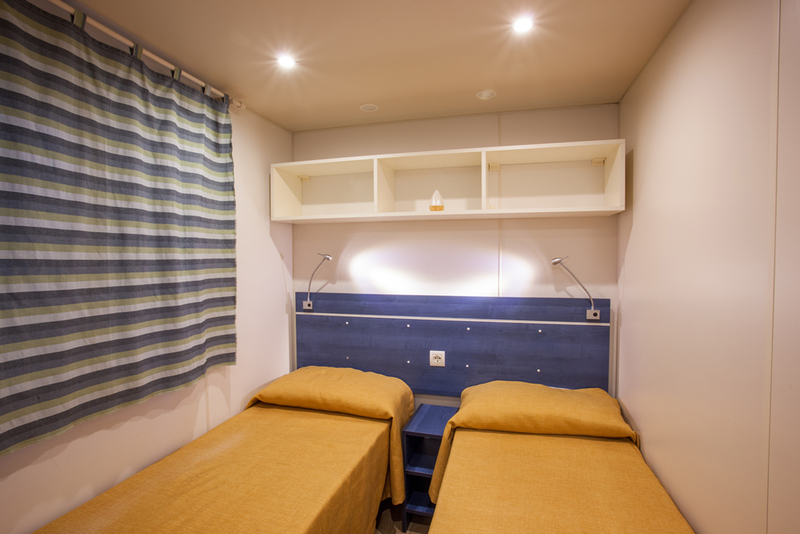 Pets are not allowed in the common areas such as the bar, the market, the swimming pool, the five-a-side football pitch and the toilets.